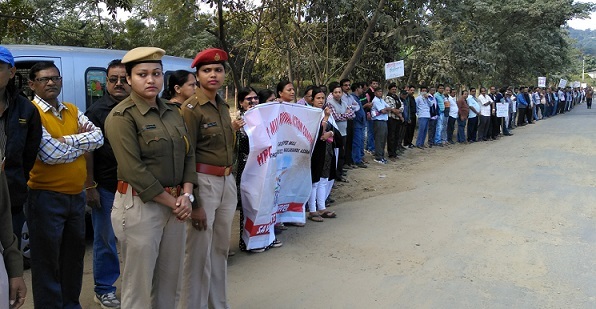 Nearly 250 employees of the Cachar Paper Mill formed a human chain at Dholeswar, the meeting point for the three districts of Barak Valley to protest the Assam Chief Minister Sarbananda Sonowal’s visit of the region on Wednesday. The employees of Cachar Paper Mill chanted slogans like ‘CM hai hai’ and ‘Narendra Modi hai hai’ for their failure to reopen the Cachar and Nowgaon Paper Mill. The agitators also blamed both the heads of the Government in Assam and Centre for stopping their salary for the past 24 months and also holding back the amount of Rs 90 crore released as per a presidential order. The protestors also shouted in unison the slogan ‘no salary, no vote’. He added, “We condemn both of them for being liars. The Chief Minister is coming to Barak Valley today to plead for votes and we have formed a human chain to protest that,” said Chakraborty. Heavy security arrangements were made as Assam CM Sonowal was scheduled to address panchayat election rallies at Katlicherra of Hailakandi, Asimganj of Karimganj and Lakhipur of Cachar district throughout the day.